In 1967, the City of Davis installed America's first protected bikeway. In 1967, the City of Davis installed America’s first protected bikeway. The parking-protected bikeway was not only the first of its kind, but was actually illegal until the citizen’s campaign convinced the California legislature to change state law to allow it. A version of the bikeway ban existed for decades after the first lane was put in; it was only recently that the state freed cities to install their own protected lanes. 50 years later, much progress has been made, but much more is needed. Long Beach-based activist and consultant Charlie Gandy noted earlier today that People for Bikes completed their Green Lane Project. That brought almost 400 protected bike lanes throughout the country and lifted many of the legal hurdles. People for Bikes has a great summary of the Green Lane Project and its successes, that can be read here. Locally, Davis has continued to be a success story for building a truly bike-friendly city. 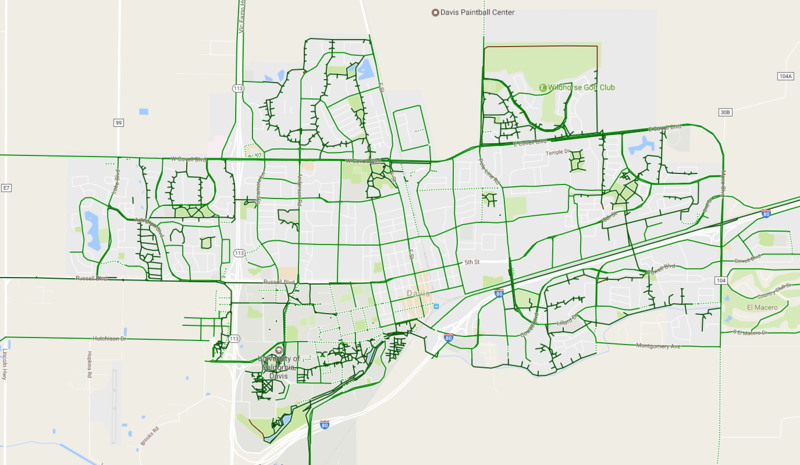 From a petition started by two professors wanting a protected bikeway after seeing them in Europe in 1967 until today, Davis has been a leader in creating a bike-friendly city. The city is only 10.5 square miles with just over 66,000 residents, yet it has built nearly 100 miles of bike lanes, paths and loops. It was the first city to receive a “platinum designation” from the League of American Bicyclists in 2005. It became home to the fist “platinum university” in 2013. It was the first city to install a protected intersection just two years ago. So today, we say “helmets off” to Davis, for getting the ball rolling. We’ll have more on the 50th anniversary as the year goes forward, but for today we’re encouraging all readers to submit their favorite pictures of bicycling in Davis. All media may be used in a future Streetsblog California post about the bikeway anniversary. Post in the comments section, or tag @streetsblogcal on twitter or @streetsblogca on Facebook. Uh, there were separate bikeways in the 19th century. Protection is in common law on highways, allowing anyone to use the roads, subject to not blocking traffic. In any case “protection” is relative to how many cars there are squeezing you off your part of the road. If you really mean a stripe limiting the travel way, that is also pretty old. Can’t give any pictures now, but recently they banned all delivery/utility car movement in certain areas on campus during class changes on the hour. Davis’ on-street bike facilities are nothing remarkable; there aren’t a lot of protected on-street lanes. There are a few good cycletracks near elementary schools, but what has really saved them is their planning department over the years, not the transportation department. They planned all these back-path networks when approving development expansion. Look at all the dark green lines.